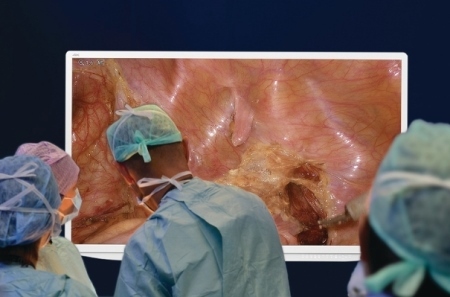 Olympus' VISERA 55-inch primary operative display transforms minimally invasive surgery into an immersive experience. Image courtesy of Olympus. Center Valley, PA -- Olympus, a global technology leader in designing and delivering innovative solutions for medical and surgical procedures, among other core businesses, today unveiled VISERA 4K UHD System, its state-of-the art Big Screen surgical system, at the Society of American Gastrointestinal and Endoscopic Surgeons (SAGES) 2016 Annual meeting in Boston. "The color and contrast in the Olympus 4K image provides superb clarity, unlike any operative video image I have seen before," said Dr.Ninh Nguyen, Professor and Interim Chair, Department of Surgery at the University of California Irvine Medical Center.i "The image is so clear that I was able to see down to the capillary level. [Seeing the capillary level] is important for improved dissection of tissue and evaluating the perfusion of the tissue." "With the introduction of the VISERA 4K UHD System, we launch a new chapter in the evolution of minimally invasive surgery – the era of Big Screen Surgery," said Todd Usen, President, Olympus Medical Systems Group at Olympus Corporation of the Americas. "Olympus is committed to ensuring that as the tools and techniques for minimally-invasive surgery evolve, we achieve commensurate progress in creating imaging solutions that approximate the direct view of open surgery. By working closely with OR teams around the world, and our partner Sony who brings the most advanced electronics, Olympus is proud to provide our US customers with the VISERA 4K UHD system for the ultimate visibility and clarity during surgery." Each component of the VISERA 4K UHD System is built specifically for it by Sony Olympus Medical Solutions to ensure highest quality, control and cohesiveness of the unit.